We hope this letter finds you doing well as your child(ren) settle in to their post camp / school year. As you know, Echo Lake is a community that emphasizes treating people with respect, building self-esteem, and generally spreading Warm Inner Glows. We are Dedicated to Human Development and remind our community to Be Nice and Try Hard. We wanted to take this time to communicate with you about how this translates into the “off-season.” We hope you will read it with your child(ren) and use this as an opportunity to have a conversation with them about the ways they treat others – and others treat them – when they are not at camp. While at camp, we expect that campers are inclusive, welcoming, and respectful. We attempt to create a camp community where both campers and staff feel comfortable to be themselves. We also exhaustively train our staff – and discuss with our campers – that acts of meanness, exclusion, or bullying are not consistent with what Echo Lake is all about and any such behaviors are dealt with swiftly should they occur. 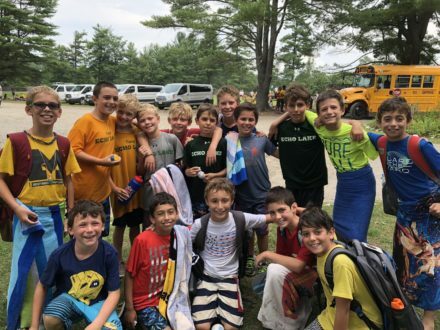 “Campers and Staff…. When you get home, some of you are going to go online to places like Facebook, Instagram, Snapchat, and other online platforms. Here are a few things to remember when you go Online. Being “Liked” on Social Media is NOT the same as being liked (IRL) in real life. Being “Tagged” on Social Media is not the same as tagging your friends with an arm around their shoulder or a hug in person. Remember that when you write something to someone online or in a text message it should be something you have the courage to say to their face or you probably shouldn’t say it at all. Before you press send or post something, think about how you would feel if someone texted or posted what you just wrote to you. Never post any pictures, videos, or anything that you wouldn’t be proud of if your parents, grandparents, counselors, or camp directors saw. Remember that once you post something online it’s out there in the world and you no longer have control of it. While we cannot control or police how campers treat one another during the school year, we wanted to remind each of our campers, while not at camp, to conduct yourself – in person, on the phone, through email, text, or using social media outlets – in a manner that is consistent with how you conduct yourself at camp. When campers are mean, exclusionary, or bully each other it is unacceptable – but it is made even worse on social media outlets, like Snapchat, Instagram, or Facebook, where people can speak ill about others while not having to face the reaction of the person they are bullying. Please print out the offensive communication and bring it to our attention. We will communicate with the parent of the camper who wrote it so they are aware. Depending on the severity and/or frequency of this kind of behavior, we will reserve the right to revoke enrollment for the upcoming season. We know we cannot control or police the behavior of our campers during the non-summer months, but we want to send this reminder about how important it is to treat other human beings with kindness and respect. We know that you and your children already know this and our assumption is that this is one of the primary reasons you selected Echo Lake. Thank you for your attention to this – and please feel free to call or email us with any questions, comments, or concerns, at any time. We wish you a healthy, happy, and safe year filled with lots of Warm Inner Glows and we look forward to another wonderful summer in 2019! As you are aware, your camper is in the wonderful age range where many weekends are spent celebrating the Bar/Bat Mitzvahs. This is an exciting time of religious maturity, putting on fancy clothes, and socializing with peers. In its best moments these are joy filled celebrations of a young teens accomplishments, surrounded by family and friends. However, each winter we receive a couple of disheartened and disappointed calls from parents whose children had a less then celebratory experience at a Bar/Bat Mitzvah of one of their camp friends. We have heard stories of exclusion, insecurity, social isolation, and sadness from our campers. In an attempt to be helpful, we wanted to reach out to you with a few thoughts that might be helpful. The reality is that Bar/Bat Mitzvahs are an unusual setting for children. Most children do not wear ties, skirts, high heels, or put on make-up. The party hall may be filled with adults but the adults are not often interacting with the children. No one is there to monitor the conversations and children are virtually unsupervised in these social settings. Bar/Bat Mitzvahs often collide friends from school, camp, dance class, soccer team, etc… This creates a new and often uncomfortable social situation where children are trying to dance their way into social comfort and seem “cool” in the eyes of their peers. By the way, they are doing all of this at a time when developmentally young teens are feeling the most self-conscious, the most socially awkward, and the least secure in who they are and how they should behave. Add to that feeling a fancy outfit, a loud DJ, a mix of peers, and minimal adult interaction and Bar/Bat Mitzvahs quickly become the Wild West of teenage angst. We are not advocating for how Bar/Bat Mitzvahs should be celebrated, however, we wanted to reach out with some thoughts to help prepare you and your child. We know that Bar/Bat Mitzvahs can be expensive but please be mindful as you make your guest list. If a child is the only child in a camp group, or one of very few children, not invited, it can feel bad. Make sure your child is wearing something that they feel is comfortable and makes them feel confident, not self-conscious. Talk to them before the party about who is going to be there and who they might want to sit with. Try to create a carpool situation where they are arriving and departing with a friend or two. Discuss with them what happens at a Bar/Bat Mitzvah. Talk about the seating arrangements, food, dancing, and the social experience. Ask them what they might do if their friends are dancing in a circle and they want to join. Talk to them about how everyone is feeling that same insecurity but that it makes people act in different ways. Give them the confidence that if they just stay true to themselves, they will have a great time. Reassure your child that if they are uncomfortable or feeling excluded, there are things they can do to try to change that. Encourage them to find one friend who they can hang out with and feel good around. Remind them that a Bar/Bat Mitzvah is a multiple hour experience and then things go back to normal. Let them know that if they are really unhappy or uncomfortable that they can call you and you will be there for them. Remind them that they are not the only one feeling that way, even if others will not admit that. Bar/Bat Mitzvahs are fun celebrations but if they do not feel like that, help your child thoughtfully decide which to attend so they are not feeling uncomfortable every weekend. Maybe they go to the service and not the party or pick and choose which parties to attend. After the Bar/Bat Mitzvah, encourage your child share with you what it was like. Help them process what they experienced so they are not left to interpret, or misinterpret, their experience on their own. Remind your child that camp is not like a Bar/Bat Mitzvah. At camp there are always nurturing and attentive staff to be involved in conversations and to help guide campers as they negotiate social situations. At camp there are expectations about how campers treat one another and campers are held accountable for their behavior. And, no one wears fancy clothes! Empower your child to bring the CEL to the celebration! Just like at camp, they can chose to focus on the positive fun and treat people in a kind, fair, and inclusive way. If they do this at a Bar/Bat Mitzvah, others will too. Being a good person and trying hard is what it’s all about at CEL and that’s all they have to do to bring the warm fuzzy to the party. We wish all of you Mazel Tov on your joy filled Bar/Bat Mitzvah celebrations. 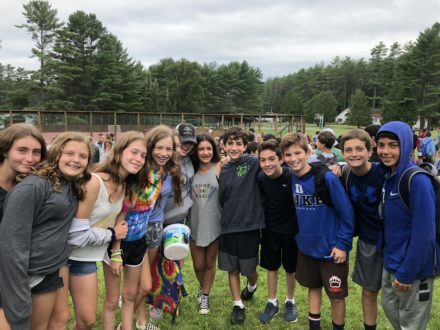 Our hope is that if the CEL community can bring all the amazing things we do at camp to the Bar/Bat Mitzvah parties we can help raise the level of happy CELebrations for everyone! Never hesitate to call or email us if you have any questions or would like to discuss anything at any time.